According to one of Facebook's early employees, founder Mark Zuckerberg admired Apple CEO Steve Jobs and modeled his early management style after Jobs' "aggressive" style.
" business cards. "It's no secret that [Zuckerberg] looked up to Steve Jobs at the time," Veloso wrote of the early days of Facebook. When designing Zuckerberg's business card, Veloso "felt comfortable" having fun with the tagline and added the quote. "Quite simply, it was a phrase I typed in that stuck," he said. According to Veloso, the cards represented the company culture at the time, but were eventually replaced as the company grew. Zuckerberg's quick rise to success and idiosyncratic style have drawn comparisons to Jobs. 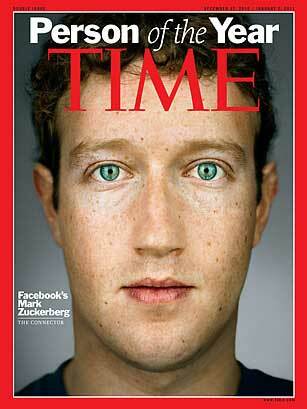 Last December, Zuckerberg beat out Jobs for the honor of Time magazine's annual "Person of the Year" title. Jobs was instead listed as one of the magazine's "People Who Mattered." The Facebook founder also topped Jobs on Forbes magazine's list of the wealthiest Americans last year. Zuckerberg came in 35th place with an estimated net worth of $6.9 billion, while Jobs placed 42nd with a net worth of $6.1 billion. Last fall, Jobs hosted Zuckerberg at his house to discuss Apple's Ping social music service. Recent rumors have suggested that Facebook is looking to work around Apple's App Store with a secretive HTML5 project in order to maintain control over its platform. However, Apple is reportedly aware of the project and is believed to have lent some "minor support" to it.